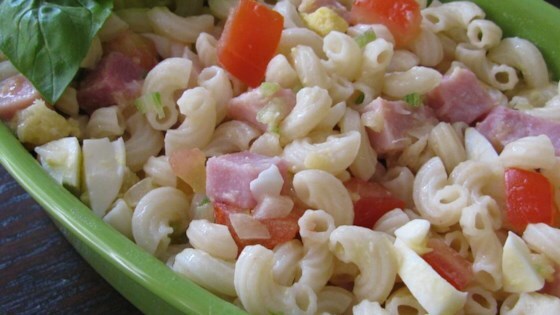 "This delicious macaroni salad is so refreshing. My husband and I came up with it using ingredients we prefer and we make this regularly during the summer to go with lunches or as a meal on a really hot day. Easy recipe to modify according to your own preferences. Get creative and enjoy!" Bring a large pot of lightly salted water to a boil. Cook elbow macaroni in the boiling water, stirring occasionally until cooked through but firm to the bite, 8 minutes; drain. Transfer hot macaroni to a large bowl. Pour Italian-style salad dressing and crushed pineapple over the macaroni; stir. Add ham, celery, tomatoes, eggs, and onion; stir. Cover bowl with plastic wrap and refrigerate until chilled, at least 1 hour. I felt that the salad wasn't as flavorful as hoped. A little flat. I forgot to buy Italian dressing so I made my own and to make it creamy, I added mayonnaise - but it was a hit. I had requests to take leftovers home. this was so good, something a little different than my usual pasta salad. sure to make it again & again!